There are two sweet chestnuts growing side by side in my favourite wood which have always given me pleasure. The first, because it seems to twist as it grows, thus appearing to be in perpetual energetic motion. And the second, which grows straight up, because it has the most beautiful bark. 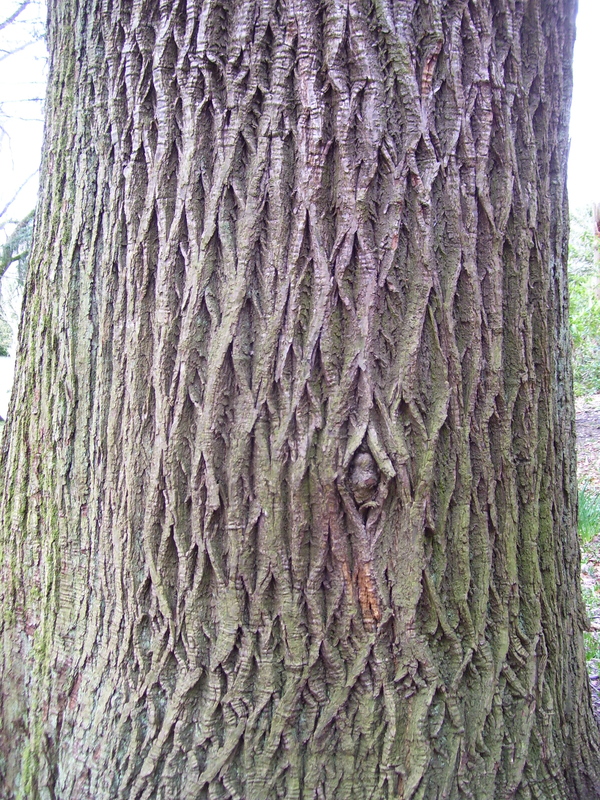 The pattern on the bark suggests that it was pleated and has unfolded as it grew, like a concertina or an Elizabethan ruff. See what I mean? Oh, and I think this tree has a tummy button too! Alternatively, it makes me think of smocking, that ancient art of beautifying and strengthening clothing. I bought or inherited one or two precious little smocked romper suits and shirts for my children when they were babies. It was so sad when the boys grew out of them and into the mundane clothes suitable for nursery rough-and-tumble. Needless to say, I still have the smocked baby clothes, packed away in acid-free tissue paper in the hopes that future generations might still appreciate such treasures. The baby clothes might be long put away, but the beautiful ‘smocked’ bark of this chestnut is there in the woods to enjoy on every walk. You might enjoy Do the twist. I’ve never thought of sweet chestnuts as having smocked bark! I ‘know’ very few of these trees. There are some at Arndilly House, Craigellachie, near where I grew up. I can’t think of any in Edinburgh outside of the Botanics – do you know of any? What you have to do now is to learn how to do smocking yourself and pass on more heirlooms, as the revered granny who smocks (and probably annoys your daughters in law no end). Come to think of it I don’t remember seeing any sweet chestnuts in Scotland before I came here. I associate them with Richmond Park, where parts of the grounds are thick with chestnuts in the autumn. Your idea of taking up smocking is a grand one. I haven’t inherited my mother’s patience or skill with a needle, though, so my daughters-in-law may be let off that particular annoyance! I saw some magnificent sweet chestnuts last year in Prague, DB, though it was the insisting I noticed more than the bark. Smocking is a perfect way to describe it. 🙂 I used to have lots of smocked dresses as a child, as my mother was very good at needlework of all kinds, but can’t remember when i last saw smocking on children in real life.. Do keep the smocked baby clothes for future use. We may have forgotten how to do it by then. That should of course have read ‘twisting’, DB. 🙂 Bother Chrome’s autocorrect function…. Aha, your correction stopped me in mid-ponder on the insistence of chestnut trees! 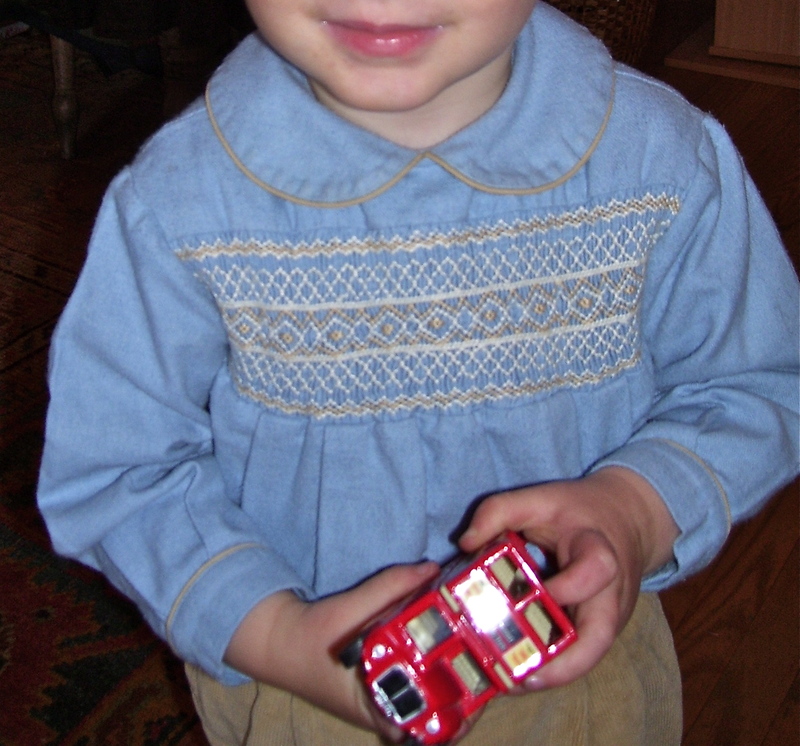 🙂 There is still a niche market for smocked baby clothes, but I must say I felt self-conscious about taking my babies out into the world dressed in such old-fashioned things when their peers were already in jeans (before they could walk!) and logo-strewn sweatshirts. Still, I was lucky to be able to just adore them at home. I think it’s interesting that smocking was once primarily for rural work-wear and has become now almost entirely limited to the ‘best’ clothes of small children. The industrial revolution more or less put paid to the rustic ‘peasant’s smock’, but how the skill reappeared in such a different guise I don’t know. 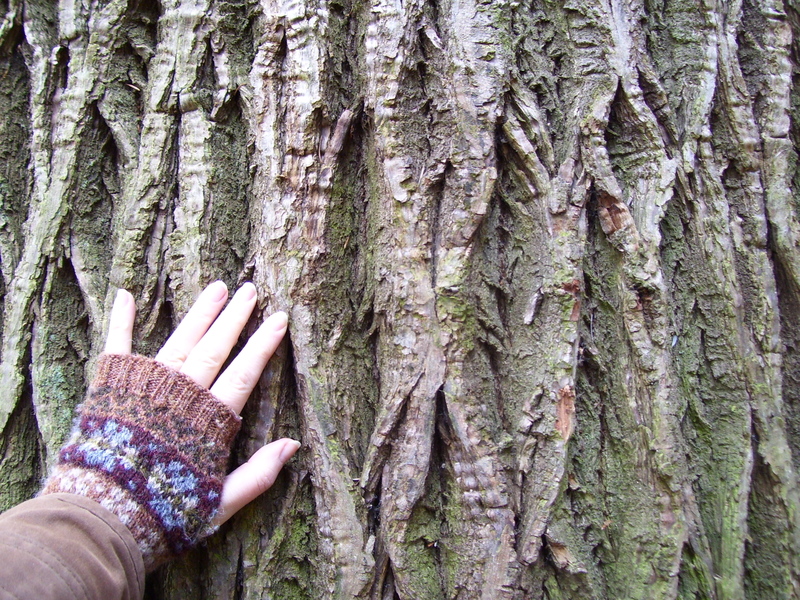 I love the bark of trees and these are two particularly fine specimens. In Spring and Summer the bark gets overlooked by the splendour of leaves. I’m glad you drew our attention to the “smocking” of the sweet chestnuts before they take on their new season greenery! I’m way behind reading and commenting on blogs….I am full of good intentions….but….sigh…. so…. hope all is well with you and yours! Oh, I’m behind too, Sian. It’s nice to see you drop by here, though! Slowly, I’m getting better at identifying more and more species of trees by their bark, instead of relying on their summer foliage. It’s a most pleasurable journey. Tummy button? 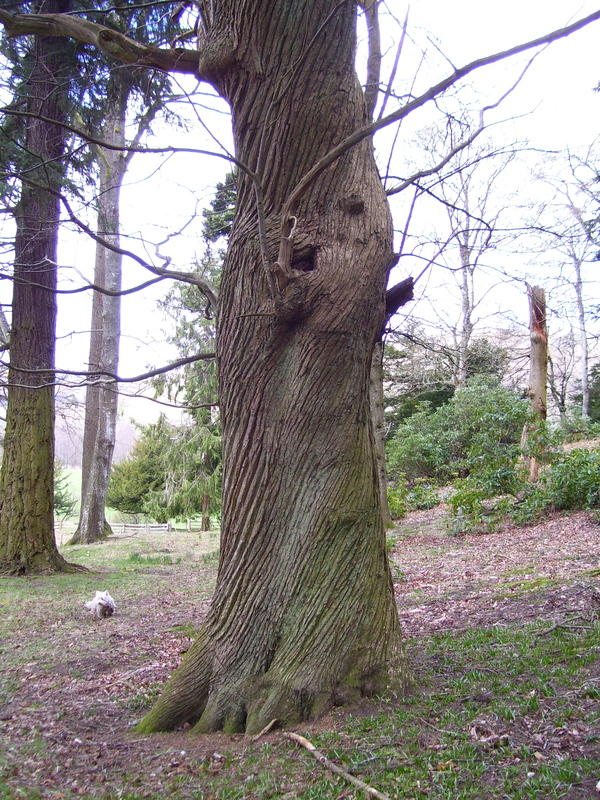 To me it resembles a little wooden face revealing itself to you–the spirit of the tree? I was taught smocking at my Belgian convent school. Goodness, how they filled up our spare time! I have never wanted to do it but later I made very nice pin money for myself hand sewing trousseau items for a French boutique. I have never wanted to sew “white on white” since. I see what you mean about the face. It’s a nice little quirk, however you interpret it. How fascinating that you were taught smocking in such a traditional context. It sounds positively 19th Century. You could write a novel about it! I hope you kept some of your pieces of needlework? What interesting trees – not content just to grow but to do it with such style. I thinks its so sad when the little ones “outgrow” smocking and are rushed into current stylish fashion. There’s just something about a small child in a smocked garment – they look cherished and angelic….just something linking heritage and history to the new future. Ours are packed away, too. Your eloquent description of children in smocking says exactly what I feel about them. I’m glad that I’m not the only mother left who appreciates how special it is! Philosophermouse did say it well, children should look cherished and angelic, not like walking advertisements for international brands. Late 19th and early 20th century illustrations show children in miniature farmer’s smocks.I believe that the farmer’s smock was translated to a girl’s dress by about 1900. The style of the dress changed just a little over decades, but both the earlier style with smocking on the chest, but no waist, and the later style with full smocking to a waist, and a full skirt, are still available in the US from certain companies in the Southern states which specialize in very traditional clothing. French insertion work is also popular in designs from those companies, and little girls have their portraits painted wearing either the smocked or insertion dresses,until about age 10.Several generations of daughters in my family have worn those clothes, and saved the best ones. When our daughter had three boys I bought each of them a smocked romper suit and kid shoes with a pearl button closure for their 3 month photographs. Anachronistic, but charming. That drifts away from the tree, which I have never seen, but will immediately recognize if I’m ever faced with one. Thank you so much for explaining the development of smocking from farming to children’s clothes. I’d always wondered, and now I know! The texture of the lower one does look like smocking (though I remember the feel of smocking rather differently having had to wear bathing suits as a child that were smocked and which, when wet, made my skin very sort). The tree in the upper photo reminds me of flake chocolate – you know the type that one puts in ice cream cones? Smocked bathing suits sound extremely uncomfortable. Far better to apply the technique to trees, I feel. I have still got some cross stitch table cloths and drawn thread work scarves made with (old parachute silk) More excitingly I have a pair of linen woven curtains which hung over a cradle and an elaborate tablecloth made by a great grandmother, with coloured threads on white. her father was a devotee of Tolstoy and he made his three daughters learn how to spin and weave. Family legend says that they were not thrilled one bit by this! What wonderful treasures. I love the idea of drawn threadwork scarves being made out of old parachute silk. I’m glad that my father never read Tolstoy though! Love the connection between tree bark and 16th century royal garb — clever! Not sure if it’s the same for you folks over there but as an American I’d wear that old-school wardrobe in a heartbeat if I didn’t think it’d get me beaten up on the subway.